Wondering if San Diego’s South Bay is the right area to start the next chapter in your life? Many are drawn to the area’s relative beach-side affordability, and for that reason, many people tend to stay longer than just a few years. There are a million different reasons to stick around, including beautiful landscapes and parks ready for exploring. The cultural diversity of the area makes this a prime spot for enjoying cuisine and art from around the world. Tourists may find neighborhoods near the border to be a great destination for shopping and dining; however, it is also a great place to call home, with plenty of areas that are rich with history and others that are just beginning to grow. This place has a taste of everything, so read on to learn more about each district and neighborhood to find out which one sounds the most appealing! South San Diego has lots of different neighborhoods and districts to choose from, each with their own unique flair. When considering neighborhoods to live in, think about the kind of conveniences and atmosphere you want to come home to on a daily basis. In South Bay, the choice is easy. No matter where you decide to settle down here, beautiful nature hikes, walks on the beach, delicious eats, and exciting attractions are all within reach! This area also gives residents and tourists the opportunity to truly experience a myriad of different cultures, all within a few districts. Within this district are three residential neighborhoods: Egger Highlands, Nestor, and Palm City. Neighborhoodscout.com’s research shows that Egger Highlands’ tends to be more affordable in terms of housing. It is a great place to be if you love the feeling of living in a coastal setting that is fairly walkable, with opportunities for sports and activities on the water. If you go south past Imperial Beach Boulevard in Egger Highlands you’ll notice a change in the feel of the neighborhood from suburban to urban, as the streets become busier and the buildings become increasingly closer together. Rent and housing prices are significantly higher here than north of Imperial Beach Boulevard. Nestor, which borders the east edge of Egger Highlands and is considered to be an urban area, has similarly priced property compared to Egger Highlands south of Imperial Beach Blvd. Of the three neighborhoods though, Palm City offers some of the most affordable housing. Price isn’t the only perk offered by Palm City - residents here have Otay Valley Regional Park right outside their doorstep which is the perfect place for walking the dog, or just getting away from the bustle of South San Diego! Are you interested in owning a 4-5 bedroom, single-family home that was built within the last 20 years on a quiet suburban street? Then Otay Mesa is for you! The boundaries of the Otay Mesa district start with the City of Chula Vista on the north, the International Border on the south, Interstate 805 on the west, and the County of San Diego on the east. This area is full of new residential and corporate developments, locally owned and chain restaurants, and many opportunities to get back to nature. Ocean View Hills Community Park, for example, is conveniently located on Ocean View Hills Boulevard, just east of Lyndhurst Terrace. It has 5 acres of lawns with picnic areas, basketball courts, and a small play area for children. If you prefer somewhere with a little more adventure, just outside of Otay Mesa is the Otay Valley Regional Park. The 200-acre park aspires to be a premier spot for hiking, biking, horseback riding, and picnicking. Looking for a little more excitement? You can always get a dose of adventure and excitement at Aquatica San Diego! Here the whole family can enjoy a number of thrilling rides, marine wildlife exhibits, and shows. Did you know this district is considered the Gateway to the Americas? With so many people coming to and from the San Ysidro Port of Entry, this part of town is a bustling epicenter. The international border crossing and the surrounding areas acts as a tourist destination for people across the globe. There are plenty of shops, attractions, and restaurants that tourists and residents can both enjoy here. If you own a business in the area that utilizes this border crossing, living nearby makes bringing goods back and forth across the border convenient! Students and residents who love to read and engage in the community utilize the San Ysidro Branch Library which is operated by the San Diego Public Library. Getting away from the busy lanes of this district is easy with the many public park options in San Ysidro including Howard Lane Park, Vista Terrace Park, and San Ysidro Community Park. A large portion of residents here are renters, despite the fact that single-family home prices are 69.2% less expensive here compared to the average home in California according to Neighborhoodscout.com. Care to move to an area that is wild and free? While this area is considered suburban based on its population, the real estate here can best be described as rural. The Tijuana River Valley is bounded by the City of Imperial Beach and the Otay Mesa-Nestor community to the north, Mexico to the south, the San Ysidro community to the east, and Border Field State Park and Imperial Beach to the west. Needless to say, nature lovers are in heaven in this district. Preserved within the Tijuana River National Estuarine Sanctuary is the most extensive salt marsh in southern California. High mesas and deep canyons along the edges of the River Valley make for adventurous hikes and biking. Even though the Tijuana River Valley is a floodplain, a surprising number of residents (many of which are students) call this area home. Due to the demand, homes here are 36.1% more expensive than other neighborhoods in California. 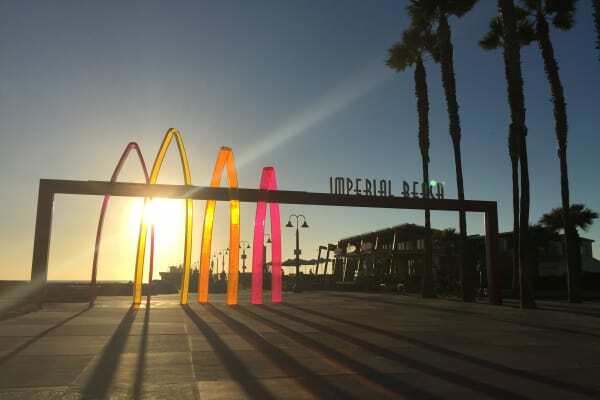 Imperial Beach is its own city and San Diego’s South Bay playground. Living here is the ultimate coastal experience. Residents and tourists can enjoy the 4-mile long beach with plenty to do including activities such as surfing, beach volleyball, horseback riding, sport fishing, and beautiful sunset strolls. If you prefer to stay closer to dry land, the Tijuana River National Estuary is one of the best birding areas in San Diego where you can catch a glimpse of many rare species of birds and wildlife. A family friendly attraction here is the Living Coast Discovery Center, which is a great way to take in an aquarium experience without breaking the bank. Community events and festivals are abundant here and will make anyone feel welcome to the area. If you’re interested in buying a home, Neighborhoodscout.com says that the median home price is $637,044. If renting a studio, condo or apartment is more your style, then you’re in luck since the rent here is lower than 46.3% of California's neighborhoods. In general, residents will find that their living expenses are comparable to that of other major cities in the US. The one factor that makes the cost of living here so much more than other areas is housing. San Diego has a reputation for not only extreme house and rent prices but also for neighborhoods of incredibly different incomes sharing borders. San Diego’s South Bay is no different. It’s not uncommon to have high-income residents with 4-5 bedroom houses across the street from low-middle income renters in apartments or high-rises. According to Neighborhoodscout.com, a home on average in South San Diego is $217,906, while just a few blocks south in a more urban setting, homes are going for double that. When it comes to deciding on the neighborhood for you, comparing home and rent prices will take you a long way. San Diego South Bay has many walkable and bike-friendly neighborhoods. However, residents generally carry out their daily lives by driving cars. Residents also use the Metropolitan Transit System (MTS) that provides numerous bus routes and the Blue Line trolley throughout the South Bay area. Some neighborhoods in the South Bay area are designed with easy commuting in mind, such as in Otay Mesa and South San Diego. In South San Diego, the greatest amount of commuters spend between 15 and 30 minutes commuting one-way to work, which is shorter than the time spent commuting to work for most Americans. Those living in the Tijuana River Valley may have longer commutes depending on their field. San Diego South Bay area is truly a paradise for those looking to live close to the beach, cultural diversity, and scenic parks and wildlife preserves. The decision to make a move, whether that be cross country or just across town, is not always easy. At A-1 Self Storage, however, we do what we can to make the process a little more convenient. Month-to-month contracts give you the flexibility to move your belongings when the time is right, and our in-office moving supply retail area helps everyone get what they need to make moving a snap. Our friendly self storage managers are always excited to greet new faces to the community and help them through finding the best self storage solution for them, so get excited about your next move by renting a storage unit today!